CIAO! COME JOIN KAREN AND SEAN IN ITALY! We are returning to Italy. 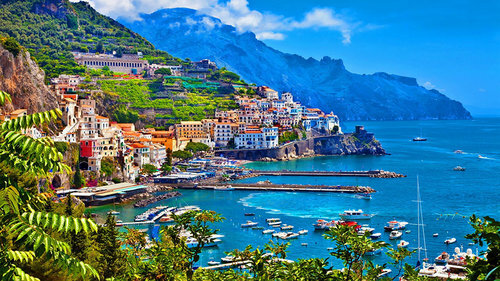 This time, to the legendary Amalfi Coast. Breathtaking views, Italian meals, immersing into the local culture, relaxation, and of course, some yoga. A magical setting you won’t want to miss. The retreat will be held at a renovated sixteenth-century Franciscan convent, St Frances. It sits just above the sea in an ancient fishing village in the Monti Lattari Natural Reserve, on the outskirts of Sorrento on the Amalfi Coast of Italy. As a renovated convent, Saint Frances offers simple, basic, clean and very comfortable accommodation. Each room opens to a spacious corridor, and all rooms have a view of the sea. There will be two or three guests per room. We’ll assign you a roommate unless you come with a friend. You may opt for a single room for an additional price, however these are limited. • Daily yoga practices next to lemon groves with sea views. 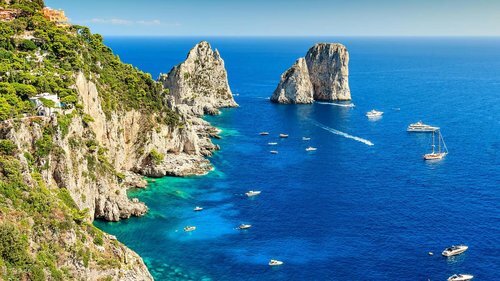 • One excursion to Capri. Other excursions will be available for additional cost. • Unbelievable food. 3 meals per day. The easiest way to reach Saint Frances Convent is to arrive in Naples by air, or Sorrento by train. Group transfers can be organized from these locations. Some may choose to rent a car for more freedom. We have a private Facebook group set up to get to know each other, discuss the finer details, and make travel groups. You may wish to travel with a friend to share the cost of renting a car. • The $500 deposit (applied towards the retreat) is non-refundable and non-transferable. The remaining balance is due March 9, 2019. • No refunds for canceling after March 9. • Students will receive a confirmation email confirming your payment as will as logistical information. • Amazing Yoga reserves the right to amend this policy at its sole discretion.